I have been on the hunt to finish the last of my pony collection, mostly i was missing some buildings and looking to start my foreign ponys. Plus i have been looking to expand my g2 collection and get some mib g1 ponies. 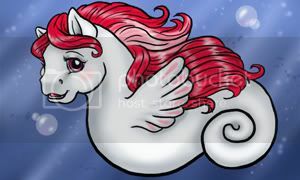 I am also a huge pony merchandise collector, i love pony stuff. As some of you may know baby applejack has decided to sell her huge collection, she was nice enough to let me look through her collection pictures and pick out all the stuff i needed. We worked together for some time and she endured countless emails from me. LOL thank you baby applejack. I live in Quebec and she lives in Ontario. So we decided to meet half ways about in Kingston Ontario. I asked my step dad to drive me down there in his pick up truck (thankfully it is a pick up) Starting out on the trip the weather was great, it was not even snowing and it wasn't that cold. After about 3 hours of driving i arrived first but there was no sign of baby applejack. Turns out she was stuck is horrible traffic and was going to be late. So me and my step dad set off to check things out around Kingston. We stopped in at a place called bulk barn, then mc Donalds, then we found a value village (didn't find any pony's). After waiting another 2 hours baby applejack shows up, so im really happy now. Even after the drive and the wait and now it is starting to get really cold and snowing. We do the exchange and the stuff doesn't all fit into the truck but thankfully we can fill the back up to. As soon as we are done we hit the road to try and beat this storm that is starting to hit Quebec. Well, another 5 hours of driving we get to Montreal (about 30 min by car to my place in good weather) but we didn't have good weather, it is the biggest storm ever, huge snow flakes, slippery roads, accidents everywhere and the bridges are packed. The pony boxes are tied in the back getting snowed on and im freaking out thinking things are going to get damaged. We left the house at 6am and we got home around 5 pm. Finally i got all the boxes into my place and put them in the pony room. i didn't even get a chance to look at it all for a long time. the holidays showed up and i had no time for anything. This purchase is my future christmas, birthday and anniversary presents for the rest of my life. yep, i know, i am officially insane. OK, now that i bored you to tears, on to the pictures of everything. mg: All that all at once... and then not be able to sit and sift through it all while the holidays take over... Oh my goodness...!!! What a trip, and what a stepdad! I bet babyaj is happy to know so much of her collection is still together, too! Congratulations on so many lovelies. VERY cool. You have more patience than I do though, I couldn't have held off over the holidays. Then again my god daughter probably wouldn't have let that happened if I had patience for stuff like that. The second I get a pony or pony lot in the mail I call her mom and she comes over for "pony happy". 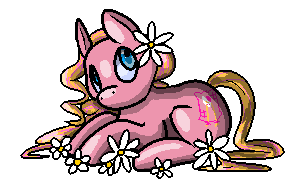 Looks like you have a lot of pony happy awaiting you with all those accessories. the paradise estate box is empty, i just needed the box to stuff my estate inside. i cant wait to go through it all and find room for it. i didn't want to pass up the opportunity to buy a big lot of stuff i need. <----------- Jealous! Wow, what goodies! I would NOT have been able to wait either, I would have been up all night if I had too! You must have some willpower! this is madness dru XD i love everything so much congrats so much! i had to wait, you couldn't even open the door all the way to get into the room. it was packed with presents and furniture. i dont even know if i can get it sorted out again. i must say the mountain boy pony's look nice in real life and i am in love with my lavender dream castle. Megan place is alot paler then i thought it would be in real life but i love it. Awww! Such excellence! *smilin'* Everything, you know it is divine, so cool..rock-on! That is a whole lot of pony goodness! So much pony goodness. Congratulations! Especially on finishing your collection. Evil cookie nappers beware for I am the glass of milk that will turn you soggy! - Dancing Jello, wannabe super pony. oh my goodness epic score. . . did you buy the whole collection? no, i didn't buy her whole collection that would have been HUGE. i guess i did buy most of the merchandise, at least the stuff i didn't have. 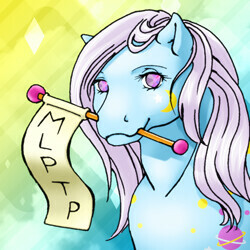 Thanks for my avatar Bittiebaby and MustBeJewel for my sig! Wow! Very nice haul. I can tell it was worth it! what is with the same door going missing ? pony weirdness. WOW. that is amazing!!! 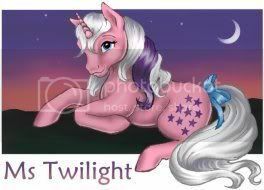 Love your story.....love the MLP ITEMS!!! OMG, Dru, that's an amazing haul! And gorgeous finds too. i started placing it in my pony room now, i got the dream castle and Megan place up. i found a spot for the dream beauties and am now working on the international shelf.